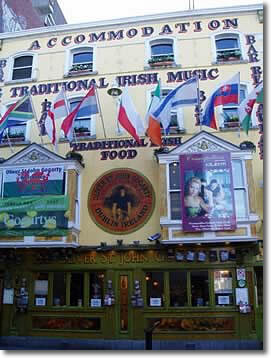 Why visit Dublin for your corporate event? Dublin is known for its friendliness, beauty, architecture and literary connections. It is a vibrant and fun European city and makes a top venue for a corporate treasure hunt. Dublin was officially founded in the 10th century but there is evidence for settlement on the site which dates back to 800 years earlier. During the middle ages, the town was hotly contested by the Danes and the Irish and frequently changed hands. It was not until Oliver Cromwell took over the city that Dublin began to really flourish, becoming the second city of the British Empire during the 18th century. At the start of the 19th century, the Act of Union took away the powers of the Irish Parliament and with it went the status of Dublin. After the Irish uprisings in the early 20th century, Dublin once again became the political centre of the Irish republic after having seen some of the worst of the fighting. Dublin is Ireland's major seaport and manufacturing town, probably the most famous employer in the city is Guinness. By the start of the 18th century, the English protestant minority administered Ireland from Dublin. It was at this time that the city was modernised. Many of the houses alongside the narrow medieval streets were demolished to make way for wider, Georgian streets seen today. Several new squares were established both north and south of the river Liffey and most of the most prestigious residences were constructed on the 'northside'. It was at this time also the Liffey was turned from rubbish dump to a cleaner river. In medieval Dublin, the houses next to the river backed on to the Liffey - this was reversed during the Georgian redevelopment. The beauty of Dublin is enhanced by the numerous 18th and 19th century buildings that have survived. One of the first things that springs into the mind of many people at the mention of Dublin is the folk song 'Molly Malone', however there are many more links to illustrious figures of literature such as James Joyce (Ulysses), Jonathan Swift (Gulliver's travels), Oliver Goldsmith, WB Yeats and of course the Jonathan Ross look-alike ... Oscar Wilde!